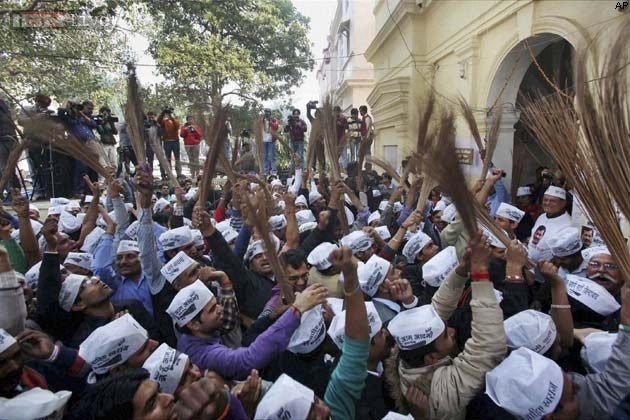 A massive hashtag, err, crowd gathered outside the office of a news channel showing the news on Kejriwal's crime. DELHI — More than a week after Chief Minister Arvind Kejriwal’s deranged mass-shooting at a local mall, his most ardent supporters admitted that they are still as loss on how to draw conclusion about the horrendous incident. “Sure when Modi strangled two billion Muslims in 2002, it was all acche din but a little mass murder, and media goes crazy!” tweeted “Roflmao AAP” one of his manic excitable supporter on twitter, referring to Kejriwal’s shocking murder of 5 shoppers at city mall on March 15. Since the shooting, Kejriwal supporters across the country have tried hard to evade the issue address the shocking crime, with most of them severely criticizing media for disproportionate coverage of the incident. A massive hashtag, err, crowd gathered outside the office of a news channel showing the news on Kejriwal’s crime. “Not that it matters, but Media has been deliberately spinning this wrong way, not surprising considering it is financed by Adani, Ambani, Jindal … oops did I say Jindal… please scratch that,” was the vehement response of “Aap ki Pretatma”. On further prodding she suggested media could cover it in a more crazy balanced manner, for instance, how the mass murder was just a further demonstration of Kejriwal’s passion and perseverance. Back to Kejriwal’s supporters, even though the overwhelming majority has dismissed this as a distraction, there have been some dissenting voices, “Prejudiced Arnab”, has hinted to something darker, a conspiracy involving Amit Shah, Adani and the living fossil from MDH ad. However our attempts for explanations were cut short by his attempt to bite our correspondent. Even after the video of Kejriwal surfaced, in which he is seen as taking oath to continue committing such heinous acts until “desh badalne pe majboor ho jaye bc” (in his own words), none of his supporters are ready to admit that there might just be something wrong with Kejriwal. More worryingly there have been excited murmur among Kejriwal supporters to “Go Kejriwal”, one supporter on being asked confirmed this insisting, “At least he is doing something”.